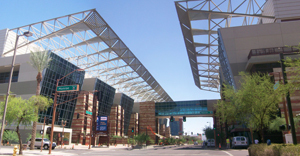 Print Source 1 is centrally located less than five miles from the Phoenix Convention Center and Scottsdale Convention Center. Our convenient location allows us to quickly deliver any Phoenix convention or trade show printing on time and without any additional delivery fees. Our high-end digital equipment allow us to print fast turn-around trade show and convention printing that will meet even the most difficult deadlines. Not only can we meet your deadlines, but we’ll save you from costly shipping charges and overnight Fed-ex bills. You won’t have to worry if your packages have arrived safely and your trip will be much easier without having to carry all the additional materials with you. Get a great price on convention printing by contacting our convention specialist Doug Dickson directly.